The Roman conquest of Britain had been underway for four years when a new Roman commander, Publius Ostorius Scapula, was assigned to the province in 47 AD. 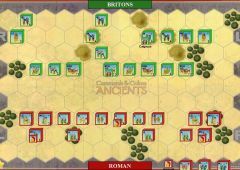 He faced an on-going insurgency, led by Caratacus, chieftain of the Cautuvellauni tribe. 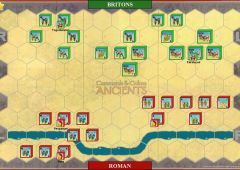 In 51 AD, Caratacus took up a good defensive position with his tribesmen on high ground with the Severn River to his front. Most of the hills were steep, and he constructed rough stone ramparts where the hill slope was not as great, making it difficult for the Romans to close with his forces. At first, Scapula did not want to attack the strong defensive position. Only the eagerness of his men - and the prospect to finally bring Caratacus to battle after chasing him for so long - changed his mind. Scapula ordered a frontal attack. 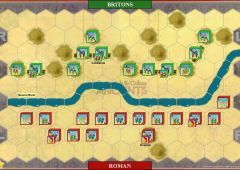 The Romans crossed the stream with little difficulty, but suffered heavy casualties from the rain of enemy missiles. Once across, the legionaries swarmed over the stone ramparts and up the steep hills. 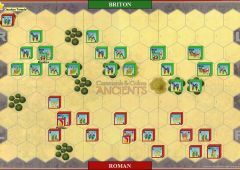 At close quarters, the Romans’ superior weapons and tactics took a heavy toll on the tribesman, and their resistance collapsed. Caratacus escaped, but the battle of Cefn Carnedd was the final battle in his resistance to Roman rule. • The entire Severn is fordable. • The hills are very steep. A unit that moves onto a hill terrain hex from lower ground must stop and may not battle this turn. A victorious unit that momentum advances from lower ground onto a hill terrain hex will not be able to have Bonus Close Combat. A unit that battles up hill in close combat will battle with 1 die. A unit that battles down from a hill in close combat will battle with 2 dice. 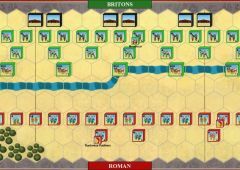 A unit that battles from hill to hill will battle with a maximum of 3 dice or the unit’s close combat dice, whichever is less. 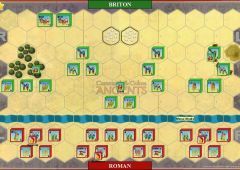 • A Rampart is removed when occupied by a Roman unit or the unit moves through the Rampart hex. The single biggest trick here for the Romans is knowing what best attacks what. And not forgetting your missile weapons. 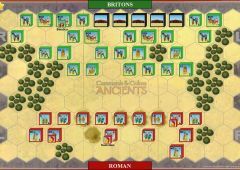 For the Barbarian side, the tactics are relatively simple, but the timing of your activity is crucial. At least the above are true in my experience with this map.